The 2017 indoor track and field season culminates this weekend at the 2017 NCAA Indoor Track & Field Championships in College Station, Texas. We’ll be on-site in the Lone Star State starting Thursday, but before we get down there we’ve previewed the mid-d/distance events so that you can know what to watch for at the meet. Below you’ll find our look at the men’s and women’s distance medley relays, where the Oregon Ducks are favored in each race. Can Cheserek deliver a third straight DMR title for the Ducks? As in 2016, the outcome of this race hinges on whether Oregon runs Edward Cheserek on the anchor leg. Last year, we predicted Oregon wouldn’t do it as they didn’t need the points. Cheserek ran it anyway, doubling back from the 5k with less than 35 minutes’ rest and splitting an incredible 3:52.84 to lead Oregon to victory. This year, Oregon needs the points. Desperately. So even though Cheserek is entered in the mile, 3k and 5k — and no athlete in history has won three individual events at a single NCAA Indoor meet — we think he will quadruple and anchor the DMR as well. As we pointed out in our analysis of the team race, even if you give Cheserek the win in the mile, 3k and 5k, Oregon is only projected to score 35 points (30 points from Cheserek + 5 from Damarcus Simpson in the long jump). That’s not going to be enough. It’s taken at least 40 points to win NCAA Indoors every year since 2002, and at least 52 points every year since 2009. Florida is projected to score 53 this year. Oregon could pick up points in other events (they have seven entrants not projected to score, including the DMR), but the best way to goose their total is to turn that 0 in the DMR into a 10. Oregon coach Robert Johnson could put Matthew Maton or Tim Gorman on anchor, each of whom has run 3:58 this year, which could be enough to score but likely not enough to win. Or he could put in Cheserek, who gives the Ducks a better chance to win but carries a small risk: that he’s tired from the mile prelim/5k final and that he’ll be more tired for the mile/3k finals on Saturday. If Oregon is to overcome the gap to Florida, they need a best-case scenario. That means being aggressive in search of big points, and that means quadrupling Cheserek. The 5000-DMR double is obviously the toughest one, with just 35 minutes separating the start of the races, but Cheserek is so good that he come back and anchor Oregon to victory as long as they aren’t totally out of it by the anchor leg. And they won’t be. Oregon will likely have a 3:58 miler on the 1200 leg (whichever one of Maton/Gorman doesn’t make the mile final) and assuming Marcus Chambers (46.40 sb) is available, they’ll have the #2 400 leg in the field. So all they need is an 800 leg. Their best 800 guy is Mick Stanovsek, who has run 1:50.63 this year as a freshman. Ideally you’d have a sub-1:50 guy, but we just don’t see Stanovsek losing enough ground for Cheserek to be totally out of it at the final exchange. And if he’s within a few seconds of the lead, it’s game over as Cheserek is the fastest anchor leg by far (remember, he set the NCAA mile record of 3:52.01 two weeks ago). If Izaic Yorks, a 3:53 miler and total stud, couldn’t drop a tired Cheserek with a 55-second first 400 and a 3:54.24 split last year, what chance does the 2017 field have against him? Yes, he’ll have one more race in his legs this year with the mile prelim, but a 3:59 mile over three hours before the DMR won’t make much of a difference. A win for Oregon would also make history as the Ducks would be the first school to win three straight men’s DMR titles. In seven of the nine years, the winning team’s anchor had run at least 3:57 or its equivalent. Only two teams in this year’s field have a guy who’s run that fast: Oregon and Oklahoma State (Josh Thompson ran 3:56.89 this year). And if Thompson qualifies for the mile final, we think he skips the DMR to focus on the mile. Ole Miss’ Craig Engels has run the equivalent time for 1500 (3:37.66) but he’s not as fit right now after losing training time earlier this year due to a broken clavicle. It’s telling that Ole Miss hasn’t put Engels on anchor in any of their DMRs this year. We already respect the hell out of Cheserek for entering the mile, 3k and 5k, but if he were to win all of those events AND the DMR, that performance would have to go down as one of the most remarkable feats in NCAA history, regardless of sport. It might be the most impressive NCAA track & field quadruple since Jesse Owens broke three world records and tied a fourth at the 1935 Big 10 Championships. And if Cheserek pulls off the quadruple and Oregon wins the team title, the NCAA should just give Cheserek the trophy directly and engrave his name on it. Who will win the men's DMR at 2017 NCAA Indoors? Believe it or not, in their storied history the Oregon Duck women have never won an NCAA DMR title. Expect that to change on Friday as the Ducks attempt to be the first school to sweep the DMR titles since Michigan in 2005. This UO team is loaded and already showed what it could do on January 27 in the Armory when the Ducks smashed the collegiate record, lowering 2009 Tennesee’s mark by over two seconds to 10:48.77. That team consisted of Lilli Burdon (3:20.56 1200), Ashante Horsley (53.77 400), Raevyn Rogers (2:03.53 800) and Katie Rainsberger (4:30.93 1600), and the squad they trot out at NCAAs could be even better as Horsley was only the Ducks’ third-fastest 400 runner this year. Elexis Guster was tops at 52.85 and she isn’t entered in the individual 400 at NCAAs. Even if Oregon wasn’t so strong through three legs (Rogers is the best 800 leg, with BYU’s Shea Collinsworth the only woman who figures to be close), we’d still like Oregon’s chances as Rainsberger is the MPSF mile champ and split 4:30 (solo) earlier this year. Of Oregon’s four legs, only Rogers (800 prelim) won’t be 100% fresh, and she’ll have had an hour and a half to recover. On paper, the Ducks are just too good for us to see them losing. The team with the best chance to beat the Ducks is Stanford. They can run Rebecca Mehra on the 1200 leg (2:05 800, 2:43 1k, 4:17 1500), Gabrielle Gayles (53.97 indoors) on the 400 leg and Olivia Baker (2:01.02/NCAA outdoor runner-up) on the 800 leg. Neither Mehra nor Baker ran on the team that qualified, though Mehra may not be available at NCAAs considering she hasn’t raced since January. If she does run, Mehra vs. Burdon is a wash, and Gayles and Baker aren’t that much slower than Guster and Rogers. Stanford also has a very good potential anchor leg in Elise Cranny (4:09 1500, NCAA outdoor runner-up). If we knew Cranny was in that kind of shape, we’d say they have a shot to beat Oregon. But Cranny ran the DMR two weeks ago at the MPSF meet, and while her split (4:34.8 according to the Stanford website) wasn’t bad, she was run down by Colorado’s Dani Jones, who received the baton behind Cranny. Jones, in turn, lost to Rainsberger earlier this season in the 3k. Penn State’s Danae Rivers (4:32 mile) is another woman who may be able to challenge Rainsberger on the anchor leg, but unfortunately for Penn State, Rivers can only run one leg. Penn State’s fastest 400 runner this year (Frances Bull) has only run 56.74, and that’s a big deficit for likely 1200 leg Julie Kocjancic (4:40 mile) and 800 leg Rachel Banks (2:06.99) to overcome. Rivers will also be doubling back from the mile prelims while Rainsberger is fresh. LRC prediction: The Ducks sprint squad might be good enough to win the NCAA team title without any help from the distance group, but they’ll get some help here. Oregon has the best first three legs and even if it’s close at the final exchange, Rainsberger may well be the best anchor in the field (her 4:30 solo split earlier this year was nuts). We don’t see how the Ducks lose. 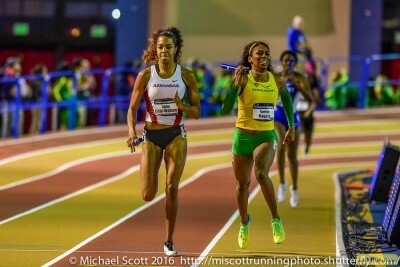 Who will win the women's DMR at 2017 NCAA Indoors?